Fiji journalists have less training and lack journalism qualifications compared with Papua New Guinea but are better paid, according to a new study on Pacific media. However, wages and salaries for journalists in both countries are poor with almost half of surveyed Fiji journalists being paid $10,000 a year or less and more than two-thirds of PNG journalists in the equivalent K10,000 band. A summary of the findings of the survey of 106 journalists in 13 news organisations in Fiji and PNG, conducted in 2001 by Auckland University of Technology senior lecturer in journalism Dr David Robie, was presented at the Australia-based Journalism Education Association (JEA) conference in Suva, Fiji, last week. The findings have also been published in a new book by the author, Mekim Nius: South Pacific Media, Politics and Education. The book was launched in Suva last week by USP Acting Vice-Chancellor Professor Rajesh Chandra and Tongan newspaper publisher Kalafi Moala. The survey followed similar research as a pilot study in 1998/9. 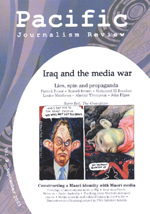 The earlier findings were published in Australian Studies in Journalism journal. Commenting on the findings, Dr Robie said: "Marked differences were found in the profiles of Fiji and Papua New Guinean journalists, especially in education and professional formation, salaries and in their professional attitudes. "In general, Papua New Guinean journalists were better educated, older, more experienced, but more poorly paid. "While there were similarities in the core values of journalism between the two countries, PNG journalists appeared to have more sophisticated values in their relationship and role within the community, which is likely to be attributed to tertiary education." In both countries, journalists (86 percent of those surveyed) regarded investigative journalism as important to the new media's commitment to its Fourth Estate role. However, more journalists in Fiji (46 percent) regarded culture as more of an obstacle while more PNG journalists (35 percent) saw lack of resources as a problem. "The issues of pay and cultural factors pose serious questions about the impact these may have on the autonomy of journalists and the Fourth Estate role of news media in a South Pacific democracy," said Dr Robie. He called for more research in this area while remarking that his book explored some of these issues. Comparing the 2001 findings with the earlier research, Dr Robie said the proportion of PNG journalists with degrees and diplomas had climbed from 73 percent to 81 percent, almost threefold higher than in Fiji. "Yet there had also been some changes in Fiji. While in 1998/9 just 14 percent of Fiji journalists had a degree or diploma, by 2001 the number had increased by more than a third. 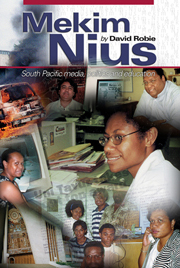 "This reflected the growing number of graduate journalists entering the workplace from the University of the South Pacific. 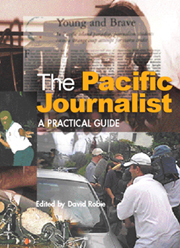 "Conversely, the proportion of journalists without basic training or qualifications climbed slightly in both countries to almost half of all journalists in Fiji (49 percent) and 14 percent in PNG." The mean age for journalists in Fiji was 24.7 years and in PNG 28.9 while the mean experience in Fiji was 3.5 years - an increase over 1998/9 - and 5.5 years in PNG. Salaries and working conditions stirred many strong and bitter qualitative comments from respondents, reported the author. "More than two-thirds of PNG journalists (68 percent) were in the lowest paid band of between K5000 and K10,000 a year. Almost half of the Fiji journalists (47 percent) were in the lowest range. "Significantly more Fiji journalists were also in the two next highest scales of $10,000 to $15,000 (23 percent) and $15,000 to $20,000 (21 percent). In both categories, PNG fared at 14 percent and six percent respectively." Asked how journalists ought to be trained, 53 percent of Fiji journalists opted for a combination of cadetship and university education while just 9 percent thought they should be recruited as school leavers and trained on the job. However, asked the same question about the perceived view of their news organisation, 47 percent favoured cadetship and university education and 30 percent said their organisation preferred school leavers. In Papua New Guinea, the views were reversed. None opted for school leavers while 62 percent favoured university education with a media industry internship. PNG perceptions about the view of their news organisation showed six percent in favour of school leavers learning on the job with 46 percent supporting university education and an internship.